What PSI are you pushing at? Confirm the gas and liquid dip tubes are matched to the appropriate post. Gas posts have a groove cut into the wrench flats of the post, liquid does not. It is possible the poppet in the liquid out post is still clogged/clogged again. That's a lot of hops in that kit. I would avoid transferring the beer again; you'll greatly increase the risk of oxidation by doing so. When you cleaned and sanitized the keg, did you push sanitizer through your tap line to make sure that made it through the tap? Your blockage could be up at the tap head or somewhere in your line so this is an easy test. 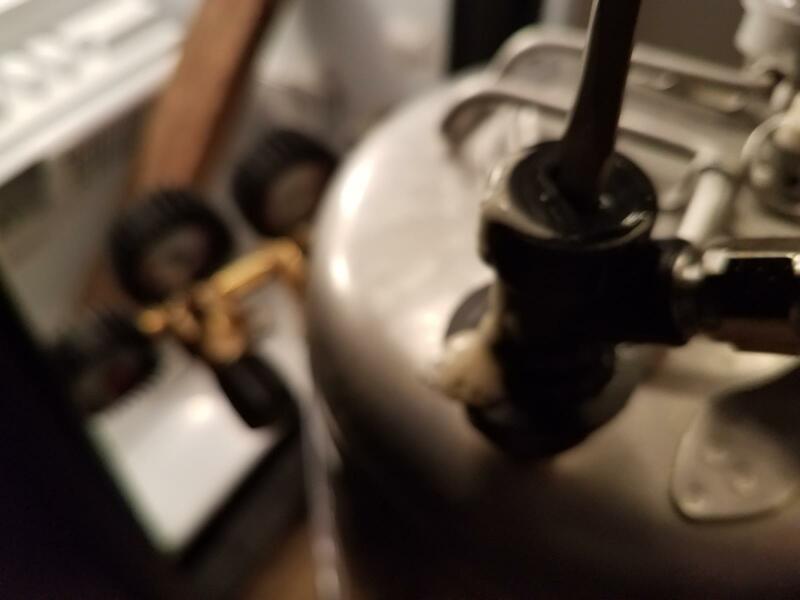 My SOP after cleaning out my kegerator lines is to put about a quart of StarSan into the keg, pressurize it to serving pressure and push the StarSan out through the taps. This ensures the cleaned lines are sanitary and pressurizes the empty sanitized keg until the next time you're ready to fill it. Also, with the amount of dry hops in this kit, did you dry hop in the fermenter or did you add some to the keg? I have done both but I always loosely bagged my dry hops in a muslin bag so I never had a huge amount of loose hop matter to worry about. About 15 to 20 PSI for a couple days to carbonate it. I did leverage the C02 pressure to push out the sanitation through my lines. And I did not dry hop in the keg. Thanks, this sounds exactly like my issue. See my next post for an update. So I fiddled with a couple things. Being my 1st time really working with a C02 setup, I took my time. It was nice having a release valve on my regulator and on my keg as I could test pressure to the keg. I was also able to push the hole in the 'OUT' connector to ensure pressure\beer was coming through. It was. So I was then left with just the poppet. So the poppet had a slot on the top, so I slowly unscrewed it (while attacked) and I got pressure beer coming out of the top of the poppet. See picture. So now I think I am where SGwink is. I did take the poppet apart and saw the spring and the pin, but didn't know what to do next, so here I am. I will probably try what SGwink did remove the pin and the spring to see if the beer starts flowing through the tap. If this works, I'll have to make a mental note that this may not work when the keg is under more pressure (when carbonating the beer). Sorry Sneezles61, I missed your question. It's the basic out-of-the-box 2 keg system from Northern Brewer. Once you remove the spring and valve in the poppet there is nothing to compress the spring in the tap line coupler. That's why it becomes essential to remove both. It makes a straight line through the system. However. You won't be able to take the coupler off without fully releasing the pressure in your keg or you'll have a beer fountain! Mine seemed to hold serving pressure no problem in this configuration. I wouldnt suggest it for every batch but after I took my poppet off 5x in a row with gunk in it, I had to try something. Okay, first off thank you all so very much! I am glad I took a picture as it seems it has helped you guys assess exactly where I am stuck. So in Voltron's picture, I just need to remove the item labeled "poppet valve" which sits between the "pin lock gas fitting" and the "short gas dip tube". Having said that, can I disassemble the that "out" post without transferring my beer? Is there any risk of something falling back into my keg (of beer) when I disassemble it? Relieve the pressure in the keg first, and you'll be fine. No need to transfer the beer. 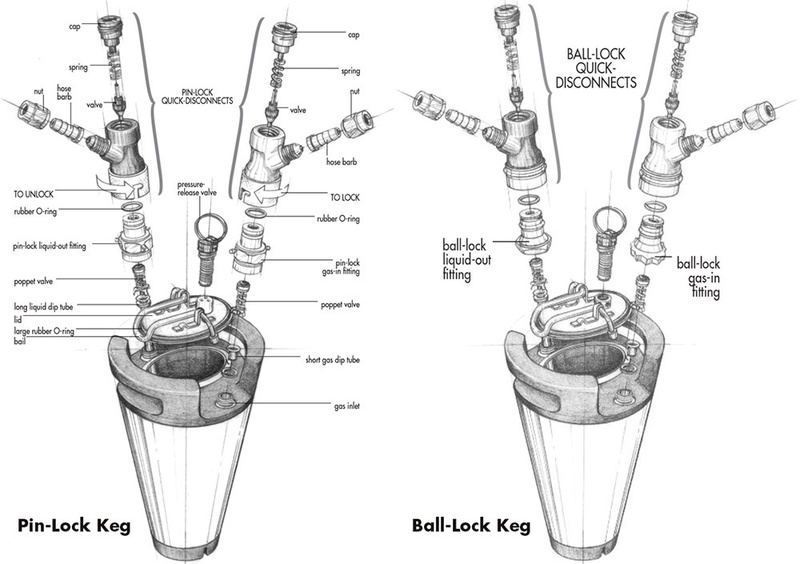 The wrench size for the new kegs is typically 11/16", but some other kegs may be 7/8". Not mine, just one out there on the internets I used to refer to. This was it, the schematic was very helpful as this was the first time I had started to take a keg (or outlet) apart. And when I did, I found a lot of funk on the spring. I had to clean it one or more times before it finally started to flow.